to know our fun flippered friends up close and personal. 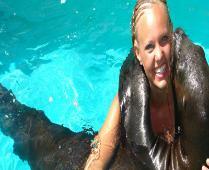 sea lions in our specially designed pool. exactly what's on their minds. Their barks, honks and trumpets will have everyone giggling. and if you're really lucky, a big fishy kiss. with the ocean's most flirtatious mammals.